Most Americans don’t like to give any thought to their taxes between when their tax returns are due in mid-April and when their income forms arrive at the end of January. (Scratch that: they don’t want to think about tax anytime outside of the two weeks in early April when they scramble to assemble their returns!) The exception is when they start a new job and are asked to set up their income tax withholding by filing a W-4. A version of this post first appeared on GradHacker. Graduate students and postdocs – lucky us – have extra opportunities to consider tax withholding, namely every time we change funding from a compensatory source to a non-compensatory source or vice versa. Compensatory funding for your stipend comes from your job as a research, teaching, or graduate assistant. Non-compensatory funding for your stipend comes from fellowships and training grants that are technically awards, not payment for work. (If that distinction makes little sense to you, you’re not alone!) Similarly, postdoc salaries can come in compensatory and non-compensatory versions as well. As the vocabulary that universities use for these types of funding varies somewhat, here’s how you can definitively determine which type you receive: Compensatory pay is reported at tax time on a W-2. The broadest statement that can be made about non-compensatory pay is that it isn’t reported on a W-2. Universities have different methods for reporting this pay, which include: a 1098-T in Box 5, a 1099-MISC in Box 3, a 1042-S (for international trainees), a courtesy letter, and not at all. When it comes to tax withholding, compensatory pay is handled by universities the same way employee pay is handled by employers: The trainee files a W-4, which calculates the fraction of each paycheck that will be sent to the IRS throughout the year. Each spring, the taxpayer files a tax return that delineates her exact amount of tax due, and any excess money withheld is refunded or any additional tax due is paid. That system is relatively easy to grasp because it’s the same as what all employees in the US experience. Fellows (by which I mean trainees whose stipends/salaries are non-compensatory) usually have a different experience with respect to tax withholding, which is the focus of this post. 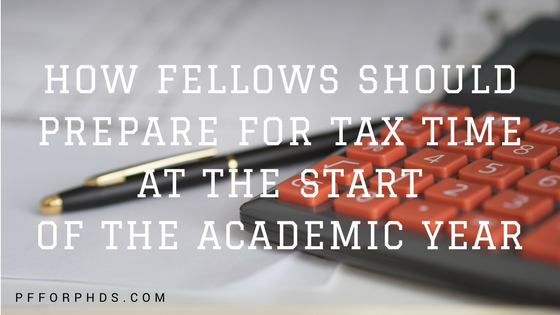 A small number of universities allow fellows to set up tax withholding using a W-4, just like trainees who receive compensatory pay. If you are a fellow at one of these universities, file your W-4 and join the rest of the country in putting taxes out of your mind until next spring. However, the large majority of universities do not handle any tax withholding on behalf of their fellows. This does not necessarily exempt those fellows from sending tax payments to the IRS throughout the year; by default, the IRS expects to receive regular payments from each taxpayer. Instead, fellows must engage with the 1040-ES and estimated tax payments, which are more typically used by the self-employed. (But: graduate students are not self-employed!) This omission of services on the part of the universities can be especially challenging for first-year graduate students on training grants or receiving fellowships, who not only may be unfamiliar with the quirks of non-compensatory pay but also the US tax system at large, especially if they have never been a full-time employee. 1) Use Form 1040-ES to estimate the amount of additional tax you will pay for 2018. You will enter your expected adjusted gross income for 2018 in line 1. If your grad student stipend or postdoc salary is your only income, simply multiply the income on your paycheck by the number of paychecks you expect to receive in 2018. If you have a side income or were otherwise employed prior to starting your fellowship/training grant, add in that income as well. The worksheet will then walk you through a truncated version of the calculations you will make on your tax return: subtracting your deduction (standard or itemized), calculating your tax due, and factoring in your credits and self-employment tax (from your side income, possibly). In the end, you will have three relevant numbers: the estimated amount of tax you will owe for 2018 (line 11c), the amount you have to pay throughout 2018 to avoid being penalized (line 12c), and the amount of withholding expected in 2018 (line 13) (for instance, from your job or compensatory pay prior to your switch to non-compensatory pay). 2) Determine whether you are required to make quarterly estimated tax payments, and do so if you are. If for 2018 you expect to have more tax withheld than the amount required to avoid a penalty, once again you can forget about taxes until next spring. If for 2018 you will owe at least $1,000 in additional tax, you are required to make quarterly estimated tax payments. (Exception: If your withholding in 2018 is greater than the smaller of 90% of your 2018 tax due or 100% of your 2017 tax due if your 2017 tax return covered 12 months. See Figure 2-A of Publication 505.) You will send in to the IRS one-quarter of your additional tax due (line 15) by September 17, 2018 (for the period of June to August), January 15, 2019, April 15, 2019, and June 15, 2019. You can pay by mail using the vouchers in Form 1040-ES or online at www.IRS.gov/payments. If in 2018 you will owe less than $1,000 in additional tax, you are not required to make quarterly estimated tax payment, but you will owe a lump sum at tax time. 3) Set up a system of self-withholding to prepare for your tax due quarterly or yearly. Whether you are required to pay quarterly estimated tax or a lump sum at tax time, the best practice to handle those payments is to prepare for them with each paycheck. Basically, you should simulate your own personal tax withholding system to avoid being forced to come up with a large sum quarterly or yearly, which can be a shock to your budget or cash flow. For the time that you receive non-compensatory pay, you’ll have to stay on top of making your quarterly estimated tax payments or verifying that you are not required to make them. First-year graduate students in particular should redo Form 1040-ES in January for their 2019 income, because while receiving non-compensatory pay for only the fall semester might not meet the requirement for paying quarterly estimated tax, receiving it for the entire calendar year probably will.